I’d been looking for a simple but fun project do to with Kaden, so we went to Hobby Lobby to see what we could find. 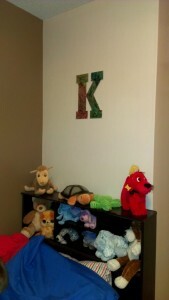 We walked all through the store and the partical board letter ‘K’ was what he wanted most. Which was fine with me since it only cost a few dollars. So we took it home and got started. 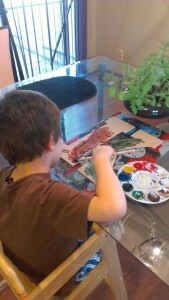 I gave him a paintbrush and finger paint (That was the only kind of paint we had, but it worked just fine) and he went to town. 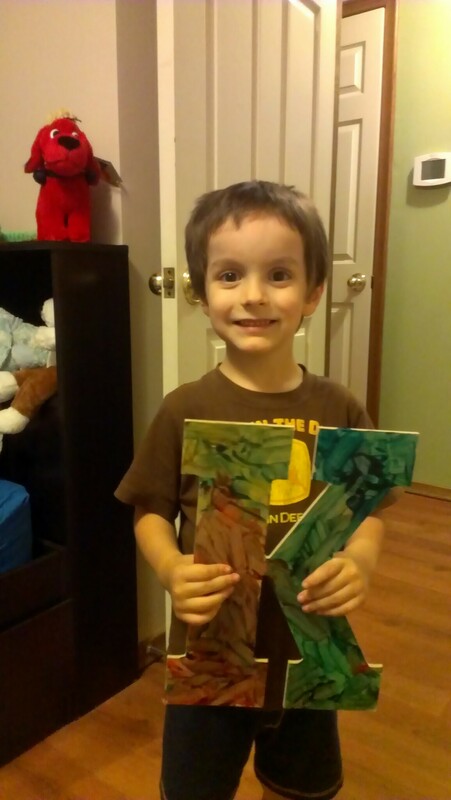 He had a blast getting to paint it and was so excited to hang it on his bedroom wall. Waiting for it to dry was the hardest thing ever for a 4 year old to do. After it dried I glued a picture hanger on the back with some extra epoxy glue I had laying around from a previous project, and voila! He’s pretty proud of his creation.